Getting dressed for work can be a struggle – you want to wear something that shows people how awesome you are at your job without taking the focus off your work. Here’s what always works: a classic button-down. Investing in a high quality, elegant business shirts is one of the 4 secrets to always look chic and will make building a work wardrobe that you love a lot easier. Women’s dress shirts are available in a wide range of colors and patterns. We have selected 5 business shirts from Ella Hopfeldt collection that embody professionalism while giving you room to display individualism. The classic white shirt has long been a wardrobe staple, and with good reason. It is clean, timeless and will go with everything. 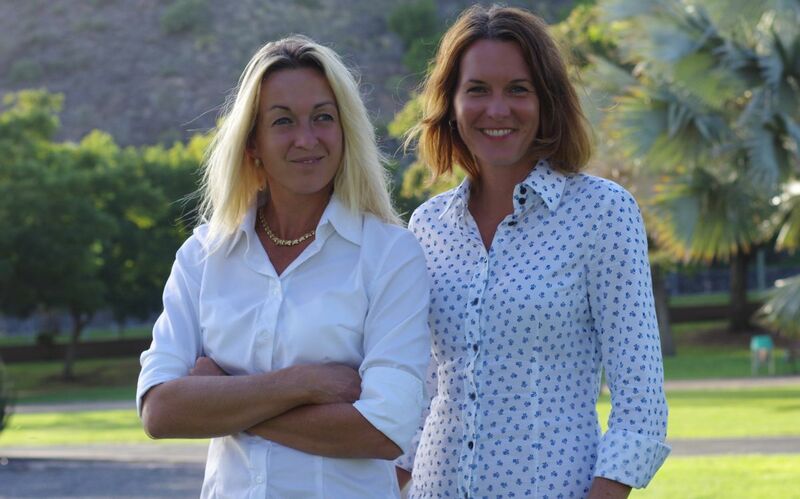 Women love Ella Hopfeldt white shirts for their tailored fit, easy care fabric and outstanding collars and cuffs. Get at least one and wear with everything from suit to jeans. This shirt will truly make you stand out with exquisite style. A French cuff is a double cuff that doubles back on itself and is held in place with cufflinks. Pick a pair (or two) of beautiful cufflinks to go with your shirt and you will look and feel like a million dollars. French cuff shirts are perfect for upscale events but can absolutely be worn for less formal settings – they have a place in your office as well as a night out on the town. 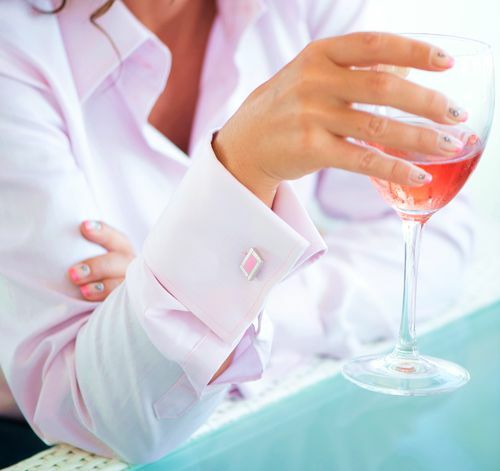 Pick a white, light blue or pink French cuff shirt from Ella Hopfeldt collection and experience the difference of a truly luxurious shirt. Gingham shirts look good on everyone for one simple reason – the forgiving pattern hides wrinkles and draws the eye away from any extra weight. Having a go-to gingham in your closet is essential for the reason that it can be dressed up or down to match the mood. The navy blue and light blue gingham shirts from Ella Hopfeldt collection will keep you feeling stylish for any occasion. Crisp yet cool, strong yet smooth, these lightweight Ella Hopfeldt shirts are loved for a good reason. This shirt is great for days when you want to dress up a little and stand out in the crowd. Contrast trim is a stylish option for your business shirt – different color fabric inside the collar and cuffs can make a shirt more appealing and versatile. The details are, above all, a good chance to glam up your shirt and make your own style statement. 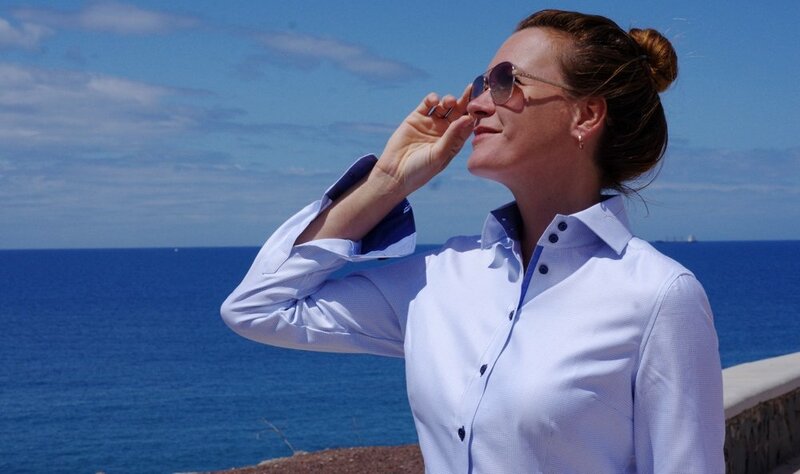 The business shirt with blue details from Ella Hopfeldt is classy, comfortable and unique. 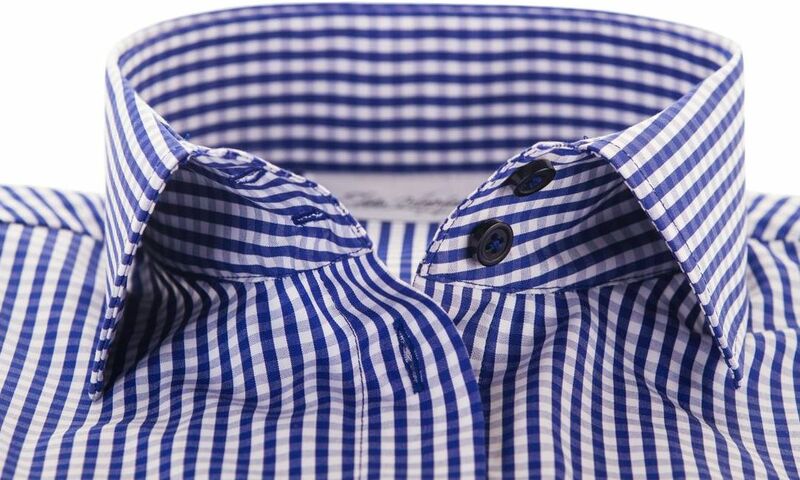 The luxurious, high quality cotton fabric is soft to the touch and lends a subtle shine to the shirt. This shirt is sure to enliven your presence at meetings and highlight you in the office. Looking superb has never been so effrotless! Light blue shirt is another essential to a woman’s wardrobe offering some of the same benefits as the white shirt. It is versatile, it always appears professional and it allows the wearer to add a splash of color to her outfit. If business shirts belong to your wardrobe and you’re looking to find fitted, figure flattering women’s shirts, you are in the right place. At Ella Hopfeldt, we offer four masterfully fitted shirt designs to help every woman find an ideal fit for her height, body shape and size. Find your Ella Hopfeldt fit and experience the glory of a perfectly fitting business shirt!